Coverage: Watch live on BBC TV, online, mobiles, tablets and BBC Sport app, plus highlights and darts extra programmes. 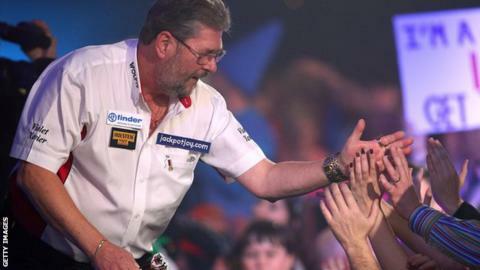 Three-time champion Martin Adams expects the focus to be on other leading contenders at the BDO World Championships, which start on Saturday. The 59-year-old, who was beaten by Scott Mitchell in last year's final, is the number two seed at Lakeside and plays his first-round match on Tuesday. "The good thing is I've got no pressure on me this year," Adams told BBC Sport. "The pressure's on the number one, which is Glen Durrant, and the defending champion, which is Scott." Adams continued: "I can just sit in the background and watch it all happen. I haven't got to worry about any additional pressures - just the pressure of going up there and playing." Lincolnshire-based Adams won the title in 2007, 2010 and 2011 and has lost in two further finals, including to fellow Englishman Mitchell last January. Neither finalist was able to forge a two-set advantage in a close contest, before a stunning 158 checkout by Mitchell in the deciding set turned the match in his favour. "You're never happy when you lose," said Adams. "Every game you play, there's one winner and one loser. You have to take it on the chin when you lose. "But Scotty was great. He didn't know what to do when he won it. I said 'give it a large one and enjoy it'." Mitchell had never made it past the second round at Lakeside before winning the tournament in 2015. He famously spent some of his prize money on a new tractor for his family's farm. No longer is he in the background - he is now the scalp every other player in the draw wants to take. "The target on the back is huge," said the 45-year-old, who will play either Craig Caldwell or Alan Soutar in the first round on Sunday. "I've got a tough draw, whichever one of those two I get. The guy [Caldwell] has not travelled over from New Zealand to come here and lie down, or it's a guy from Scotland [Soutar] playing a guy from England. It will be a great game, no matter what happens. "You have to respect every competitor that's there, but I know that I'm playing all right. Confidence is bigger for you than any form." In sport, crushing defeats can often be the making of a player. So it has proved for Durrant, the BDO's world number one. The 45-year-old from Middlesbrough was involved in a classic semi-final with Adams 12 months ago, missing three darts at a double to win the match before losing 6-5. "There was a strong possibility my career could have gone downhill after that," Durrant told BBC Tees. "He really did break my heart last year." Far from being the end, it was the start of a very special year for Durrant, who can count the World Masters and Finder Masters among his multiple title victories in 2015. Durrant identified the need for a stronger mental state to allow him to challenge for the bigger titles - something he has sought help for since his semi-final defeat by Adams. "It's a fundamental side of the game now," he continued. "I'd even say 80% is in your mind. "I still throw exactly the same as I did 10 years ago, my balance is the same and I use very similar darts, but I'm more experienced and I'm definitely stronger in the mind. "Sometimes you can go too far with the psychological side. There's no 'hocus pocus' to what I'm doing - it's just a guy who says the right things before I play and a few things during the game that are different to what I've done previously." Mitchell and Adams are two of five world champions in the 40-man field. Scott Waites, the 2013 winner, is the ninth seed, while 2001 champion John Walton will end a three-year absence from the World Championships after coming through qualifying. And there is also a welcome return for Ted Hankey, one of the sport's great characters, whose last appearance on the Lakeside stage was a semi-final defeat by Christian Kist in 2012. Shortly afterwards Hankey, who won the BDO title in 2000 and 2009, made what proved to be an acrimonious and unsuccessful switch to the rival Professional Darts Corporation. 'The Count' has also battled ill health in recent years, most notably when he suffered a stroke during a match at the Grand Slam of Darts in November 2012. Can Ashton make it a hat-trick? Sixteen of the best female players in the world will also be in action at Lakeside, with the women's World Championship running concurrently with the men's event. Bolton's Lisa Ashton has won in each of the past two years and returns to Frimley Green as the number one seed, but there are some former champions hoping to end Ashton's attempt to complete a hat-trick. Nine-time winner Trina Gulliver and three-time champion Anastasia Dobromyslova are both in the draw, as is 21-year-old Fallon Sherrock, who hit six 180s in a narrow final defeat by Ashton in 2015.